Roger Federer can reclaim the Nº1 ranking if he wins Wimbledon and Novak Djokovic doesn't advance beyond the semifinal. 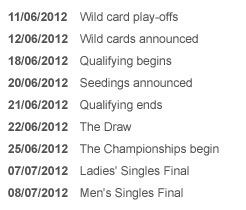 ATP World Tour created a table to show how tough the battle will get at Wimbledon for the top position in men's tennis. If Djokovic makes it to the final, there is no chance for Federer or Nadal to regain the top spot. But if the Serbian only gets to the quarter-finals or the semis, Nadal and Federer could both retake the most-wanted position in the ATP ranking.